Meanwhile, China has quietly and rapidly expanded its influence without deploying its military on foreign soil . Jeremy Scahill: One of the things that you’re best known for is a book that continues to this day to be relevant when studying covert U.S. operations around the world, as well as the international narcotics trafficking industry, and of course you tie both of those together. We’re going to get into all of that in a moment but I wanted to begin by asking you to assess this current moment that we’re in with Donald Trump. How do you see him in a historical context, and what does his presidency represent about the American Empire? 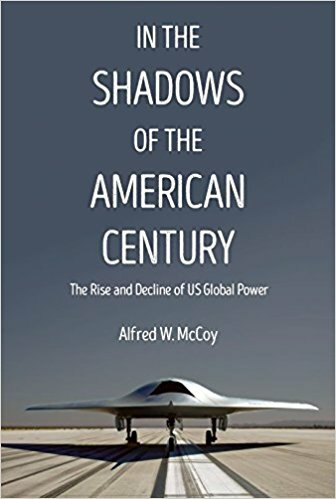 Alfred McCoy: What I think right now is that, through some kind of malign design, Donald Trump has divined, has figured out what are the essential pillars of U.S. global power that have sustained Washington’s hegemony for the past seventy years and he seems to be setting out to demolish each one of those pillars one by one. He’s weakened the NATO alliance; he’s weakened our alliances with Asian allies along the Pacific littoral. He’s proposing to cut back on the scientific research which has given the United States — its military industrial complex — a cutting edge, a leading edge in critical new weapons systems since the early years of the Cold War. And he’s withdrawing the United States, almost willfully, from its international leadership, most spectacularly with the Paris Climate Accord but also very importantly with the Trans-Pacific Partnership. And he seems to be setting out to systematically demolish US global hegemony. Now, it’s important to realize that the United States is no longer the preeminent global power we were, let’s say at the end of Eisenhower’s presidency, back in 1960. Our share of the global economy has declined substantially. We’re about to be eclipsed by 2030, by China, and become the world’s number two economic power. China’s making some breakthroughs in military technology. The world system is spreading its wealth and there are a number of second tier powers, the rise of the European Union, et cetera. It’s a more complex world, so United States can no longer dictate to the world, or at least much of the world, like we could back in the 1950s. Having said that, the presidency is a weaker office internationally than it used to be. Nonetheless, there are presidents, and I say Barack Obama was one of them, George H.W. Bush was another, these presidents through skillful diplomacy, their knowledge of the international system, their geopolitical skills, they could maximize U.S. influence on the world stage. They could use U.S. military power strategically, deftly, they could lead international coalitions, they could set the international agenda. Trump is turning his back on all of that and I think he’s accelerating perhaps markedly, even precipitously, the U.S. decline. JS: Since Trump became president, everyone is sort of wrapped up in the palace intrigue, and what did Trump know about Russia and when did he know it, and did he know about Don Jr’s meeting with this lawyer who is being described as “Kremlin-connected?” And I think all of that is a very important story because it could bring down his presidency, but at the same time my sense is that the CIA and the darkest elements of the U.S. military are actually in a pretty flexible position right now because Trump is so hands-off and, because as you say he’s not an effective manager of empire. What are your thoughts on that? AM: That’s correct. Much of the military establishment and its links with the intelligence community is in place. Let’s say that some of the new initiatives— cyberwarfare—well the Trump Administration understands the importance of that and indeed he has advisors that do, so the continued evolution of that, the development, that will continue, space warfare is in a long-term trajectory. Weapons systems take as long as 10 years to go from design, prototype, testing, and either rejection or acceptance. So that transcends any administration, even a two-term administration. So there’s a long-term trajectory. President Eisenhower, that famous phrase that he warned us about in his last address, the military industrial complex—he built a complex in which he integrated scientific research, basic research in the universities and private corporations, and then dozens of defense contractors who have more or less permanent contracts to maintain their research and production establishment—he integrated that with the U.S. military and that will survive any American president. Unfortunately what Trump doesn’t seem to understand is that there’s a close relationship between basic research, like research in artificial intelligence, and your capacity to come up with the next new thing that will give the United States a leading edge in military technology. And that’s what he doesn’t understand, that’s the one way he’s damaging the whole complex. But otherwise, you’re right, it’s on a longer-term trajectory about ten, ten-year cycles of research, procurement, and deployment of new weapon systems and that transcends any single administration. JS: We’ve seen this kind of convergence of the agendas of some neoconservatives who formed part of the core of the “Never Trump” movement of Republicans and then the liberal elites that host shows on MSNBC or are identified as “Democratic strategists.” And this line that we’ve seen repeated over and over is that, what they deride as people calling the “deep state”—in other words, the elements within the CIA in the military—that they’re actually secretly protecting the country from Trump. Given your scholarship on what people loosely call the deep state right now, what do you make of those claims that the CIA and certain elements within the Pentagon are actually the protectors of the Democratic republic? AM: A complex argument. One: the rapid growth of that state documented by The Washington Post, in a series about eight years ago, 2010, what they called the fourth branch of the U.S. government. That under the terms of the global war on terror, a massive infusion of nearly a trillion dollars into the Homeland Security. And all of the 17 agencies in the so-called intelligence community plus the considerable expansion of the Joint Special Operations Command, which is the military’s permanent integration with that security apparatus, that secret security apparatus, all of this has built a fourth branch of the U.S. government. And I think that, just as Congress has proved independent from the Trump administration to a certain extent, and we’ll see about the Supreme Court, those are the classic three branches of executive, legislature, and judiciary—now we have this fourth branch. And, what you’re proposing is we need to take this very seriously when we look at the array of power in Washington, DC. And I agree, we need to. And like all of the other branches it will coordinate with the executive because the executive has a great deal of power, of funding, you can set priorities, but it has a ten year cycle—ultimately a much longer term cycle of preparation and responsibility. A president is in office for eight or maybe four years. A military career, if successful, an intelligence career, is thirty years. So those professionals and the agencies they represent, have a much longer term viewpoint. You can see this, for example, in the periodic reports of the National Intelligence Council, that every four years when there’s a new administration coming in, they’re the one agency of the U.S. government that looks ahead twenty years. Not just four or eight or ten. But they actually look ahead twenty years and they try and see the shape of the world and then, set, through the intelligence community and through the national security establishment, priorities for coping with this fast changing world. So at the apex of the intelligence community, there is this formal procedure for establishing a long range, or medium range, twenty-year perspective. So, yes, they look longer, they have their own policies, they have their contracts, their programs that are in many ways autonomous from the executive, and increasingly so. And depending on your point of view and how it plays out, that’s either a strength of the American system in the short term, when you have an executive that some people don’t like, like Donald Trump, over the longer term it could be seen as a threat to democracy, creating a bureaucratic apparatus that’s autonomous, even independent from both the executive and the legislative branch. So, it’s an open question but a good question. JS: You’ve written this excellent book that will come out from Haymarket books in September called In the Shadows of the American Century: The Rise and the Decline of U.S. Global Power. But I want to ask you about a much earlier book that you wrote, The Politics of Heroin: CIA Complicity in the Global Drug Trade. And that details your investigation—and it really was what introduced you to this world of covert CIA operations, client states, mercenaries, local proxies, and you also found yourself in conflict with very powerful individuals in the CIA and the national security state because of what you were researching. Talk about that book and the process that led to writing it and how it was eventually published. AM: Sure. Now, almost fifty years ago, looking back it was an extraordinary experience. In the space of eighteen months to two years, I acquired an amazing education. Up to that point I was a graduate student looking at the history of colonialism in Southeast Asia, writing articles that had lots of footnotes. I was a library rat. And the CIA wasn’t directly involved, but they turned a blind eye to the role of their allies’ involvement in the traffic. And so this heroin epidemic swept the U.S. Army in Vietnam. The Defense Department invented mass urine analysis testing, so when those troops left they were tested and given treatment. And what I discovered was the complexities, the complicity, of the CIA in this traffic and that was a pattern that was repeated in Central America when the Contras became involved in the traffic. The CIA looked the other way as their aircraft and their allies were smuggling cocaine from Colombia through Central America to the United States. Same thing in the 1980s, during the secret war in Afghanistan, the Mujahideen turned to opium. The opium production in Afghanistan during that secret war increased from about 100 tons of opium per annum to 2000 tons, a massive increase. Afghanistan went from supplying zero percent of U.S. heroin supply — soared to sixty-five percent of the illicit heroin supply for the United States came out of Afghanistan. The CIA sent arms across the border through caravans to the Mujahideen fighters and those same caravans came out carrying opium. The CIA prevented the DEA, the Drug Enforcement Administration, from investigating. Again, complicity in the traffic. So a clear pattern. The other thing was when I began to do that investigation and write up the book, I faced enormous pressures. My phone was tapped by the F.B.I., the I.R.S. investigated, I had an audit as a poverty-stricken graduate student. The Department of Education investigated my graduate fellowship. Friends of mine who had been serving in military intelligence were recruited to spy on me. In other words, what I found was the CIA penetrated every aspect of my life. The head of CIA covert operations, a very famous operative name Cord Meyer Jr., visited the offices of Harper and Row, my publisher, and tried to persuade the publisher to suppress the book, hold the contract, just don’t release the book, claiming that it was a threat to national security. So what I discovered was not only CIA complicity, complex compromise relationships with covert allies far away in remote places like Southeast Asia, but also the incredible depth of the penetration of the CIA within US society under the conditions of the Cold War. I found my phone, my fellowship, my friends, my publisher, every aspect of my life was manipulated by the CIA. It was a fascinating discovery. JS: And you write in your forthcoming book, In the Shadows of the American Century, “I had crafted a historical method that would prove over the next forty years of my career surprisingly useful in analyzing a diverse array of foreign policy controversies, CIA alliances with drug lords, the agency’s propagation of psychological torture, and our spreading state surveillance.” Part of the reason it seems that they were concerned about what you were investigating in Vietnam, Laos, and elsewhere was that you were tapping into something that was an emerging nexus that the CIA would rely on for decades to come. AM: Indeed. All of those areas. The method I came up with was very simple. Start far back in the past, as far back as you can go, when the — let’s say the research on torture, although somewhat secret is not controversial because it hasn’t been applied. Go back to the U.S. colonial policy in the Philippines when we started surveillance circa 1898 to pacify the Philippines, and then track it forward step by step all the way to the present, keeping in mind the patterns, the structure of the operation. And then when you get to the present where it becomes secret, highly classified, and very controversial, you understand the structure, so you know where to look, what assumptions are likely to be sound, what hypotheses might work, how you can conduct your analysis and that can lead you to an insight. For example, let’s take the case of torture, okay? I work on the Philippines as my main area in southeast Asia that I study, and I was very interested in the overthrow of the Marcos regime. I did some research that contributed to that overthrow. In the aftermath of the overthrow of the Marcos regime, there was this coterie of military colonels that had plotted an abortive coup, that had sparked a so-called People Power Revolution that put a million Filipinos on the streets of Manila calling for Marcos’ downfall, forcing Washington to provide him with aircraft that flew him out to exile in Hawaii and brought democracy. So I was very interested in who these colonels were. And what I found when I investigated them is that they weren’t line officers, say combat officers, they weren’t even intelligence officers. They were internal security officers who’ve been personally involved in torture. And what I begin to realize is that torture was a transactional experience, that these officers who’ve been trained by the CIA on how to interrogate and use torture, that, as they broke down their victims, they empowered themselves and inspired themselves to this coup to overthrow Marcos. Well, that also introduced me to the idea that the CIA was training torturers around the globe. And I figured this out in the 1980s, before it was common knowledge. There was some research in the 70s, people working on this, but we didn’t have the full picture. And what I began to figure out was also the nature of the methods that these colonels were using. Now, look, these are physical guys that were brutally, physically hazed at their military academy, as often happens in such organizations. And so instead of beating physically their victims, they use something counterintuitive. They didn’t touch their victims. They used psychological techniques. And so in 2004, when C.B.S. Television published those photographs from Abu Ghraib prison, and nobody knew what was going on. There was that famous photograph of the Iraqi detainee standing on a box with his arms outstretched with phony electrical wires attached to him, he’d been told that if he lowered his arms, he’d be shocked, and he had a bag on his head. And I looked at that photo and I said, “Those are not bad apples. That is CIA doctrinal techniques. The bag is for sensory deprivation, the arms are for self-inflicted pain, those are the two fundamental techniques of CIA psychological torture.” I wrote a book, A Question of Torture, that made that argument. I participated in a documentary that won an Oscar, Taxi to the Dark Side, that interviewed me and also made that argument, and it would not be for another ten years until 2014, when the U.S. Senate Intelligence Committee spent forty million dollars and reviewed six million CIA documents and came to a rather similar conclusions. So the method’s useful. JS: I want to ask you how we ended up with national security state that we have today? What I mean is, the N.S.A. with its vast powers, which of course you document in the book. The CIA employing tactics under what you you’ve called “covert netherworld.” There is this sense, under someone like Barack Obama, that we’re not going to send massive troop deployments around the world, as much as we are going to depend on drones, discreet covert operations, escalated use of Special Operations Forces and CIA paramilitaries. But, talk about the post World War II growth of what now has come to be known as the national security state? AM: Sure. I think the national security state is the instrument the United States used to build and exercise its global hegemony. Looking at the comparative history of empires in the modern age going back 500 years, the thing that distinguishes the U.S. empire from almost any other, is the reliance upon covert methods and it’s a result of an historical moment. The U.S. empire coincided with the decolonization, the dissolution of half a dozen European empires that produced 100 new nations, more than half the independent nations on the planet today. And so US hegemony was being exercised, not over colonies, whose sovereignty was compromised, in fact had been transferred to the imperial power, but over independent nation states, who had sovereignty. So you had an empire under conditions that denied empire. So how do you exercise hegemony in non-hegemonic world? You have to do it covertly. And in 1947, President Harry Truman, right after World War II, and Congress passed the National Security Act that laid down the bureaucratic apparatus for the U.S. national security state. That National Security Act created the Defense Department, the U.S. Air Force, the CIA, and the National Security Council—the key instruments of the US exercise of global power. And then when the next administration came in, under President Dwight Eisenhower, what he did is he realized that there were nations that were becoming independent across the world and that he had to be intervening in these independent nations and so the only way he could do it was through plausible deniability, you had to intervene in a way that could not be seen. You had to do it covertly. And so Eisenhower turned to the CIA, created by Harry Truman, and he transformed it from an organization that originally tried to penetrate the Iron Curtain, to send agents and operatives inside the Iron Curtain. It was a complete disaster. The operatives were captured, they were used to uncover the networks of opposition inside the Soviet Union, it was absolutely counterproductive. Eisenhower turned the CIA away from that misbegotten mission of penetrating the Iron Curtain and instead assigned them the mission of penetrating and controlling the three quarters of the globe that was on the U.S. side of the Iron Curtain, the free world. And Eisenhower relied upon the CIA, and then the National Security Agency, to monitor signals. And we began to exercise our global hegemony, covertly, through the CIA and allied intelligence agencies. And that’s been a distinctive aspect of U.S. hegemony since the dawn of American global power in 1945. And that continues today, ever deepening, layer upon layer, through those processes you described. The drones, the surveillance, the cyber warfare—all of that is covert. This is not new, the idea that nations interfere in in the elections of others. Walk us through some of the greatest hits of the CIA and other intelligence agencies in election interference, since the 1940s. AM: Sure—first of all, that was one of the central instruments of the U.S. exercise of global power covertly. We were promoting democracy worldwide, we stood very strongly for democracy over authoritarianism. On the other hand, we were exercising U.S. hegemony, which meant that somehow for those open free democratic contests to produce a leader who was our guy. And indeed, one of the key aspects of U.S. global power, as exercised by Eisenhower through, covertly, was the change. Look, under the colonial empires, Britain, France, Belgium all the rest, they had district officers and they worked with chiefs, maharajahs, emirs, local officials in colonial districts around the globe. And they controlled who was going to be the new emir, who was going to be the new sultan, who was going to be the new maharajah. And then, when all of those nations decolonized and became independent, the fulcrum for the exercise of power shifted from the colonial district to the presidential palace. And so the United States paid a lot of attention in controlling who were the leaders in those presidential palaces. If you look at the 240,000 WikiLeaks cables from around the world that were leaked in 2011, you’ll find that much of what they’re concerned about is, who is in those presidential palaces around the country? So the U.S. did it through coups and, during the period of the 1950s to the 1970s, about a quarter of the sovereign states in the world changed government by coups, and they also did it by electoral manipulation. One of the most famous ones, the one that actually established the capacity of the CIA to do that, was the 1948 elections in Italy when it looked like the communist and socialist parties were slated for capturing a majority of the seats in parliament, and then forming a government. And you could have on our side of the Iron Curtain, in a very important world power, Italy, a legally elected, democratic elected communist government. And so the CIA spent, bargain basement, one million dollars. Imagine: Buying Italy for a million dollars. Seems like a bargain. They spent just a million dollars in very skillful, electoral manipulation, and they produced the electoral results of the Christian Democrats, a centrist government. And, throughout the Cold War, the U.S. deftly intervened in Italy at multiple levels overtly in bilateral aid and diplomacy, covertly, and electoral manipulation and something much deeper, Operation Gladio, where they had, if you will, an underground apparatus to seize power in Italy in the case of a communist takeover, by invasion. And the CIA would intervene, they pump money into the Liberal Democratic Party in Japan, they played electoral politics in the Philippines. They intervened in Korea politics, in South Korean politics, all around the globe. Any time that there was a serious electoral contest in which the outcome was critical to us, geopolitical interests, the U.S. was intervening. Now, the difference between that and what we’ve seen with the 2016 elections in the United States, if you’re the global hegemon, you are manipulating, influencing other people’s elections. If you’re a global power like United States that stands for democracy, that’s the way we exercise that power. We did it sometimes crudely, sometimes deftly, but we didn’t invade countries, we didn’t bomb et cetera. We did it that way. And when we were manipulating other people’s elections, we’re the global power. And when we’re being manipulated, when other powers are penetrating our society and manipulating our elections, that’s a sign that we’re a declining power. And that’s very serious. In order to maintain our position internationally, not only do we have to exercise our power skillfully, covertly through the operations we’ve been describing, surveillance and the rest and overtly through diplomacy and international leadership, treaties and trade and all that, okay? But we also have to make sure that our electoral process is impenetrable, is secure, that other powers cannot manipulate us because they’re going to try. JS: I often find myself, when I’m watching the news, or in some cases even reading very serious powerful newspapers like The New York Times or The Washington Post, as they cover Donald Trump and this issue of Russia, it seems as though we are totally detached from history. And in reading your book I was reminded of the rise of Mobutu to power in Kinshasa, and also you went into great depth about the CIA crack cocaine story that ultimately was broken wide open by Gary Webb in the San Jose Mercury News, and then attacked and major news organizations trying to discredit him. Walk us through the Contra War and the connection to the selling of embargoed weapons to Iran and the fact that you had eleven senior officials in Ronald Reagan’s administration actually convicted of selling Iran embargoed arms. I mean we talk about scandals and then you look at Reagan, and it’s like 11 senior officials convicted of selling embargoed arms to finance the CIA’s death squad the Contras in Nicaragua? AM: You know, in the Reagan administration the United States was at a low ebb in its global power. The Reagan administration launched the invasion of Grenada. It was the first time in nearly a decade that the US has been able to exercise its global power anywhere beyond the United States successfully, its military power. And then in Central America, the Reagan administration felt very threatened by the collapse of the Somoza regime, one of the US client regimes in Central America, and the Sandinista guerilla movement capturing the capital Managua in 1979. And that occurred at the same time as the Soviet Red Army basically occupied Kabul, the capture of the capital of Afghanistan, so the Reagan administration felt threatened, on a kind of far periphery of U.S. power in Afghanistan, and close at home, kind of a gateway to America—in Central America. So the Reagan administration reacted by mounting two major covert operations: one, to push the Red Army out of Afghanistan and two, to overthrow the Sandinista government in Nicaragua. And both of these operations involved tolerating trafficking in opium in Afghanistan by the Mujahedeen Muslim guerrilla fighters, and tolerating the trafficking in cocaine in Central America by our Contra allies. And there were basically two forms of support for the Contras. The one was the arms-for-money deal to provide black money to sustain the Contra revolt for the decade that it dragged on. And the other thing was a kind of hands-off approach. There was a DEA operative, a Drug Enforcement Administration operative, in Honduras that was reporting on the Honduran military complicity in the transit traffic of cocaine moving from Colombia through Central America to the United States. He was removed from the country. And then the CIA, because of Congress cutting off the arms shipments periodically for the CIA, the so-called Boland amendment that imposed a kind of embargo upon U.S. support for the Contras, they needed to periodically warehouse their arms. And what they found was that the Bay Islands off the coast of Honduras, particularly Roatan Island, was an ideal logistics point right off the coast—it was a major transshipment point for cocaine moving from Colombia across the Caribbean to the United States but it’s also an ideal place for the U.S. to warehouse and then ship its arms to the Contras on the border with Nicaragua and Honduras. And so, the kingpin, the drug kingpin of the Bay Islands was a notorious international trafficker named Alan Hyde who had 35 ships on the high seas smuggling cocaine from Colombia into the United States. Every U.S. security agency involved, the Coast Guard, the CIA itself, the Drug Enforcement Administration, they all had reports about Alan Hyde being a Class A trafficker, arguably the biggest smuggler in the Caribbean. And to get access to his warehouses what the CIA did was they basically blocked any investigation of Alan Hyde from 1987 to 1992, during the peak of the crack-cocaine epidemic, and so the CIA got to ship their guns to his warehouses and then onward to the border post for the Contras. And Alan Hyde was given an immunity to investigation or prosecution for five years. That’s—any criminal, that’s all they need, is an immunity to investigation. And this coincided with the flood of cocaine through Central America into the United States. This CIA inspector general in response to protests in South Central, Los Angeles, conducted an investigation also in response to Gary Webb’s inquiries and they released Report 1, they called “The California Connection.” They said that Gary Webb’s allegations that the CIA had protected the distributors, the deal of the Nicaraguan dealers who were brokering the sale of the import cocaine to the Crips and Bloods gangs in South Central, L.A., that that all that was false. Then they issued, the inspector general in 1998, issued part two of that report, the executive summary said similarly: no case to answer, CIA relations with the Contras in Central America complex, but nothing about drugs. But if you actually read the report, all the way through, which is something historians tend to do, you get to paragraph 913 of that report and there are subsequently 40 of the most amazing revelations, forty paragraphs of the most amazing revelations stating explicitly in cables and verbatim quotes from interviews with CIA operatives about their compromised relationship with the biggest drug smuggler in the Caribbean, Alan Hyde. And if you go on the CIA website and you look for that 1998 Inspector General Report, you’ll find a little black line that says paragraphs 913-960 have been excised. Those are those paragraphs. But you can find them on the Internet. JS: One of the fascinating aspects of this— it’s a short part of your book, but I think it’s always important to point this out, the name Robert Gates pops up at the time that the CIA had this relationship with Hyde. Gates was the deputy director of the CIA, and of course now is one of the beloved figures in the bipartisan foreign policy consensus. He was defense secretary under both George W. Bush and Barack Obama. And Gates, his hands are all over this thing as well. AM: Yeah, there’s, how am I going to put it? That illustrates the disparity between the formal rhetoric of politics and the geopolitics of the exercise of global power. And the difficulties, the demands, the moral and political compromises required to run, well let’s call it an empire. A global empire. And, from a pure realpolitik imperial perspective, that Contra operation, by seeking an effective complementation between the flow of drugs north, very powerful illicit economic force, and the Contra guerrilla operations, accomplish their objective. You know? After ten years of supporting the Contras, the Sandinistas lost power for a time in a democratic election. They were finally pushed out of office. The CIA accomplished its mission. Now, if you compare that with where we are with drugs and covert operations and military operations in Afghanistan, it was very successful in the 1980s, as a result of the CIA’s alliance of the Mujahideen, provisioning of arms and tolerance for their trafficking and drugs, which provided the bulk of their finance. You know, in 1989, the Soviet Red Army left Kabul, they left Afghanistan, the CIA won. Well today, of course that drug traffic has been taken over by the Taliban and it funds the bulk of the Taliban’s guerrilla operations, pays for a new crop of teenage boys to become fighters every spring, and we’ve lost control of that. So from a realpolitik perspective, we can see a weakening of U.S. controls over these covert operations that are another manifestation of our, of the decline of the US hegemony. JS: I want to ask you about Afghanistan given all of the work you’ve done on the intersection of covert operations on behalf of an empire and transnational narcotics trafficking. I think a lot of people who have followed the history of Afghanistan and U.S. involvement there find it hard to believe that the United States is not aware that its actions are fueling the heroin trade and fueling the insurgency there by having a Taliban that relies on it, as you just laid out. Given your historical, analytical work on past crises, what should we be looking for to see whether or not there is a direct U.S. role in facilitating narcotics flow out of Afghanistan? AM: Sure. Good question. Look, during the 1980s, when that operation was successful, the CIA knew and in fact a man named Charles Cogan who was the head of the CIA operation in Afghanistan, and when he retired he gave an interview to Australian television, and he said, “Look, there was fallout from that operation. OK, yes there was fallout in terms of drugs”. But he said, “Let’s remember the Soviets left Afghanistan.” So the CIA was, and if Charles Cogan was any sign and I think he is, and he was the head of the operation for a while, they very well knew that the mujahideen fighters, the Muslim guerrillas they were arming and equipping, were getting the bulk of their finance and were sustaining their mass base among the farmers of southern Afghanistan through trafficking in opium and heroin. And that provided—I mean it provided 65 percent, the bulk of U.S. heroin supply, the bulk of the world’s supply. Now, when the United States pulled out of Afghanistan in 1992, we turned our backs on it and the Taliban backed by Pakistan took power, and under the Taliban by 2000, by 1999-2000, the opium harvest more than doubled to 4500 tons. But then the Taliban became concerned about their pariah status and they decided that if they abolished opium they would no longer be a pariah state, they could get international recognition, they could strengthen their hold on power. And so they actually, in 2000-2001, completely wiped out opium, and it went down from 4600 tons to 180 tons, I mean like an incredible— the most, one of the most successful opium eradication programs anywhere on the planet. They also completely weakened their state, so that when the U.S. began bombing in October 2001, after the 9/11 attacks, the Taliban quickly collapsed and then what happened was, of course, when the U.S. came back in, what we did was we worked through the CIA. And we put pallets of hundred dollar bills, we sent in 70 million dollars in cash, we mobilized the old warlord coalition in the far north, the warlords there were heavily involved in opium traffic. We mobilize the Pashtun warlords who were all opium traffickers, and when they swept across Afghanistan and captured the countryside in the provincial capitals, they began supervising over the replanting of opium. And, very quickly, the opium harvest began blooming and by 2006 it was up to 8000 tons of opium— the highest in a century providing well over 90 percent of the world’s opium and heroin supply, and a majority of the gross domestic product of Afghanistan. And, at the local level, the Taliban took control of the cultivation, the processing and the smuggling and they used the profits to rebuild their apparatus. They were completely wiped out in October 2001, they steadily rebuilt and have launched this succession of offensives that now control over half the countryside, so there’s a very clear relationship between the opium crop, which is now beyond our control, we ignored it up to 2004, as it was booming and spreading again. So it’s one of those interesting exercises or instances in which the U.S. loses control over this complementation between the illicit traffic and the surrogate warfare, that complementation that worked so well in Central America. When you’ve lost control of it in Afghanistan, and it’s one more index of our waning control over the world, an ever more complex world. Why do you seem so convinced that this is inevitable, and how do you foresee the scenarios, potential scenarios for the demise of what we now understand as the American empire? AM: There are, I think multiple factors, that lead to an imperial decline. If you look at the key aspects of the U.S. global power, you can see a waning of strength in every one of those. One of the key things that I think very few people understand, after World War II, the United States became the first world power, the first empire in a 1000 years to control both ends of the vast Eurasian continent. Now Eurasia, that enormous landmass, is the epicenter of world power. It’s got the resources, the people, the civilizations that—you’ve got to control that to control the world. And the United States, through the NATO alliance in Western Europe and a string of alliances along the Pacific littoral with Japan, South Korea, the Philippines and Australia, controlled the axial ends of the Eurasian landmass. And then we link that with layers of power, treaties multilateral defense treaties, starting with NATO in Europe, all the way to SETO and ANZUS with Australia, the Japan Mutual Security Treaty, the South Korea U.S. Mutual Security Treaty, the Philippine U.S. Mutual Security Treaty. And then we had fleets, we had the Sixth Fleet in the Mediterranean, the Seventh Fleet at Subic Bay Philippines, later the Fifth Fleet in the Persian Gulf. We had hundreds of military bases. By the end of the Cold War we have about 800 overseas military bases. Most of those were arrayed around the Eurasian landmass. In the last ten years as drone technology has developed, we’ve laid the latest layer upon that, which are the drone bases. There are 60 US drone bases that stretch from Sicily all the way to Andersen air base on Guam, and that, given the range of the most powerful drones, the Global Hawk, it gives us surveillance and then with Predator and Reaper, strike capacity, all the way along that rim, and that has been, if you will, the key pillars in the global architecture of U.S. power. And those pillars are starting to crumble. The NATO alliance is weakening under Trump, with the rise of Russian pressure on that alliance, but more particularly, our capacity to control those critical allies along the Pacific littoral is beginning to weaken. Jeremy, your organization The Intercept had, last April, a very important document that leaked out, the transcript of that phone conversation between President Trump and President Duterte of the Philippines, that should have had front page coverage all across the world, and every serious American newspaper. It got good coverage, but not the coverage it deserved. And it’s clear that Trump is trying to court the man, trying to impress him with U.S. strength, and every time Trump tries to do it, Duterte responds, “I will call China.” It’s a clear indication of China’s rising power along that Pacific littoral. Also, China has been conducting a very skillful geopolitical strategy, so-called “One belt, One road” or “Silk Road” strategy and what China has been doing since about 2007 is they’ve spent a trillion dollars and they’re going to spend another trillion dollars in laying down a massive infrastructure of rails and gas and oil pipelines that will integrate the entire Eurasian landmass. Look, Europe and Asia, which we think of as— we’re learning in geography in elementary school that they’re two separate continents—they’re not. They were only separated by the vast distances, the steps in the desert that seem to divide them. Well China’s laid down, through a trillion dollars investment, a series of pipelines that are bringing energy from Central Asia across thousands of miles into China, from Siberia into China. They’ve also built seven bases in the South China Sea and they’re taking control over these— spent over two hundred million dollars in transforming a fishing village on the Arabian Sea named Gwadar, in Pakistan, into a major modern port. They’ve also got port facilities in Africa. And through these port facilities they’re cutting those circles of steel that the United States laid down to kind of link and hold those two axial ends of Eurasia. So we are slowly, because of China’s investment, its development, some of our mismanagement of our relationships and long term trends, those axial ends of Eurasia they’re crumbling. Our power, our control over that critical continent is weakening, and China’s control is slowly inexorably increasing and that is going to be a major geopolitical shift. One that is going to weaken the United States and strengthen China. JS: You write, “All available economic, educational, technological data indicate that when it comes to U.S. global power, negative trends are likely to aggregate rapidly by 2020, and could reach a critical mass no later than 2030. The American Century, proclaimed so triumphantly at the start of World War II, may already be tattered and fading by 2025, and, except for the finger pointing could be over by 2030.” How do you see that happening and what does that mean for the United States in the world, but also for ordinary Americans? AM: Sure. How do I see it happening? There are the geopolitical shifts that I just described. The other thing of the long term trends, the issues of economic waning, U.S. economic strength. China is slowly, is steadily surpassing the United States as the number one economic power. That’s one long term trend. And China will therefore have the resources to invest in military technology. The second thing is, we speak of crumbling U.S. infrastructure, one thing that nobody talks about very seriously in a sustained way is the intellectual infrastructure of the country. The OECD, the Organization of Economic Cooperation and Development, the rich countries club, conducts these tests every couple years, the PISA tests, and they test fifteen year-olds. In the latest rounds of tests, Shanghai students have come number one in math, science, and literacy. U.S. students have been somewhere, in math and science, somewhere between twenty and thirty. And so you might say, “Who cares about a bunch of fifteen year-olds with braces, backpacks, and attitudes?” Well, by 2030, those fifteen year-olds are going to be in their 20s and 30s. They’re going to be the super smart scientists and engineers that are coming up with the cutting edge technology. Technology, for example, like photon communications. China is evidently going to lead in this, that means that China can communicate with its satellites and its entire cyber and space and military apparatus without fear of being compromised. We have not developed the same level of photon communications as China. We’re much more subject to being hijacked and manipulated. So, those kinds of trends in raw military power. The sort of the erosion of U.S. educational standards within ten or fifteen years can have some very serious implications for our military technology. It means you just don’t have the scientists, the technology, the innovation that has been so central to U.S. global power for so many years. And so that waning, the geopolitical shifts, you know, those invisible movements of a power arrayed across the landscape. And then the technological and educational shifts coming together means that there are all kinds of ways for the U.S. to lose power. Either with a bang or a whimper. But by 2030, it’s pretty much over for our global dominion. JS: And is that, is that in your opinion a bad thing? AM: Well, yes it is, and I here, you know I speak, you could call me, you know a narrow American. But, okay, every empire—if you think we’ve had empires in the world for about four thousand years. Some have been more benign and beneficent, others have been absolutely brutal. If you want to go to the most brutal empire, I think in human history, the Nazi empire in Europe. It was an empire. It plundered. Much of that mobilization of labor was just raw exploitation. It was the most brutal empire in human history and it collapsed. The Japanese Empire in Asia, which was arguably the biggest empire in history, was a second runner-up for raw brutality, they collapsed. The British Empire was relatively benign. Yes, it was a global power, there were many excesses, many incidents, one can go on, but when it was all over, they left the Westminster system of parliament, they left the global language, they left a global economy, they left a culture of sports, they created artifacts like the B.B.C. So the US empire has been, and we’ve had our excesses, Vietnam, we could go on. Afghanistan. There are many problems with the US exercise of its power but we have stood for human rights, the world has had 70 years of relative peace and lots of medium size wars but nothing like World War I and World War II. There has been an increase in global development, the growth of a global economy, with many inequities, but nonetheless, transnationally, a new middle class is appearing around the globe. We’ve stood for labor rights and environmental protection. Our successor powers, China and Russia, are authoritarian regimes. Russia’s autocratic, China’s a former communist regime. They stand for none of these liberal principles. So you’ll have the realpolitik exercise of power, all the downsides with none of the upsides, with none of the positive development. I mean we’ve stood for women’s rights, for gay rights, for human progress, for democracy. You know we’ve been flawed in efficacy, but we’ve stood for those principles and we have advanced them. So we have been, on the scale of empires, comparatively benign and beneficent. And I don’t think the succeeding powers are going to be that way. Moreover, there are going to be implications for the United States. Most visibly, I think that when the dollar is no longer the world’s unchallenged, preeminent, global reserve currency, the grand imperial game will be over. Look, what we’ve been able to do for the last twenty years is we send the world our brightly colored, our nicely printed paper, tea notes, and they give us oil and automobiles and computers and technology. We get real goods and they get brightly colored paper. Because of the position of the dollar. When the dollar is no longer the global reserve currency, the cost of goods in the United States is going to skyrocket. We will not be able to travel the world as we do now. We won’t be able to enjoy the standard of living we do now. There will be lots of tensions that are going to occur in the society from what will be a major rewriting of the American social contract. This will not be pleasant. And arguably, I think it’s possible if we look back, we could see Trump’s election and all the problems of the Trump Administration as one manifestation of this imperial decline. SUBSCRIBE TO THE INTERCEPTED PODCAST ON APPLE PODCASTS,GOOGLE PLAY, STITCHER, AND OTHER PLATFORMS. NEW TO PODCASTING? CLICK HERE.